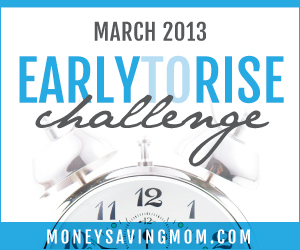 This is Day 25 of Money Saving Mom's Early to Rise Challenge! This week has been a fight. I wish I could declare it over, but seeing as it's not the weekend yet, obviously I can't. Yesterday I broke out in hives from my medication. UGH! Just when I thought we were getting somewhere with this hyperthyroid stuff. They are everywhere and I am miserable. I was able to take a benedryl yesterday along with some hydrocortison cream. This combo seems to calm them down a bit, but I still have to take my meds until my doc says otherwise. I will be putting in a call this morning! Anyways, on to the book! Today's challenge is to spread the word about the Early to Rise Challenge. We are to tell 5 people today about our challenge and where they can get the book, www.earlytorisebook.com . I've actually already been talking about this to a few people, but I'm not sure more than 3 people know about it. Hubs knows of course, and so does my mom. I'm pretty certain I've mentioned it to at least 1-2 friends. Does this count? I do love the idea of spreading the word though. I love that it could change someone's schedule and thereby change someone's life, making them better at what they do, how they live. Once this challenge is over, I will continue to get up at 5-5:30am on the weekdays. 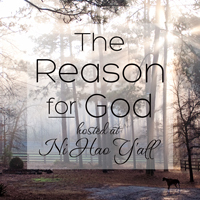 I know I have some goals I need to work on during this time and some quiet time to spend with God. So, what time did I wake up this morning? 5:23 am. Fredrika did her thing at 5 am on the dot, but I didn't get that great of a night with all the itching and what not. Benedryl, kick in now please!